Our June 2016 AntiqueFootball Artifact of the Month is a circa 1930 Goldsmith No. PH Princeton-style head harness from the collection of Robert Tibi. 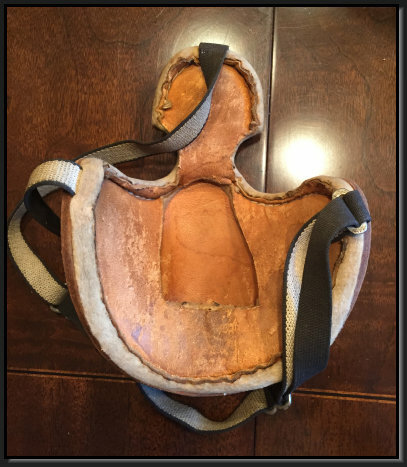 Originally acquired by Keith Javic of AntiqueSportsShop.com, the eight-attachment Princeton head harness was a 1930's variation of the four-attachment Princeton head harness made popular in the mid-1910's. The Princeton-style head harness was a lightweight football helmet designed to maximize air flow at the crown of the head. The style, which was first produced in 1912, became known as the "Princeton-style" because it was the model supplied to Princeton by A.G. Spalding in the 1910's. The initial design consisted of a leather body around the head and a separate padded leather crown attached to the body at four points. By the mid-1920's, sporting goods companies stopped manufacturing the Princeton-style helmet, focusing instead on more substantial and heavily padded designs. In 1930, P. Goldsmith & Sons of Cincinnati, Ohio reintroduced the Princeton-style as a more rigid, eight-attachment helmet. The No. PH was marketed as a "light weight type suitable for warm climates or for players desiring a light weight helmet." By 1933, Goldsmith modified the No. PH with additional ventilation holes at the ears and a fibre reinforcement to the crown to provide additional stiffness. Goldsmith also introduced the No. PC, a slightly more rigid version of the No. PH with an elastic hinge between the ear and back portions of the helmet. The eight-attachment Princeton head harness had a short production run between 1930 and 1935, and given the rarity of examples on the market today, was likely not one of the more popular helmet styles of the 1930's.